While cars, trucks and planes might come to mind first as carbon emissions Enemy No. 1, all our buildings aren’t quite as environmentally innocent as they might appear. In the US, for example, buildings account for 40 per cent of the country’s carbon dioxide emissions. In the UK, that figure is even higher: around 44 per cent. Much of those emissions are related to the energy needed to keep our buildings liveable, heating and cooling in particular. In an ideal world, our buildings should be able to generate all the energy they need all by themselves, both cleanly and on-site. And that kind of “net-zero energy building” is exactly what a new test facility in the US aims to develop. Using $15.9 million in stimulus funds from the US Department of Energy (DOE), the Lawrence Berkeley National Laboratory plans to build and operate a new National User Facility for Net-Zero Energy Buildings. The facility will contain all sorts of testing systems to figure out how best to tackle the technical challenges of building net-zero energy buildings. “This facility will serve a national audience — and need — in an aggressive pursuit of DOE’s energy efficiency goals for widespread implementation of affordable net-zero energy buildings by 2030,” said Stephen Selkowitz, head of the Building Technologies Department of Berkeley Lab’s Environmental Energy Technologies Division. Berkeley Lab researchers plan to tackle the effort with a broad base of users in the building design and construction communities, as well as manufacturers, building owners and operators, and the academic community. “We will also take maximum advantage of Berkeley Lab’s proximity to Silicon Valley and the growing interest in ‘Greentech’ innovation and investment to draw on experts there, as well as our location in a state that leads the country in applying research and advanced technology, supported by aggressive policies, toward reducing greenhouse-gas emissions,” Selkowitz added. Net-zero energy buildings generate as much energy as they use on an annual basis through highly aggressive energy efficiency and on-site renewable energy generation, making them a key element in the effort to cut carbon emissions. The new laboratory facilities will help researchers develop, test and validate the technologies, systems and design approaches that will allow net-zero energy buildings to be built and operated affordably. The new test facility will feature a series of unique energy-efficient building systems testbeds to be located in new and existing buildings at the lab. 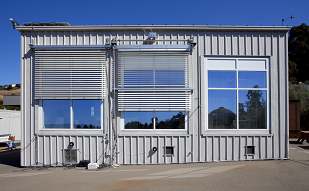 Researchers will be able to change out prototype building systems such as windows, lights, heating, ventilation, air conditioning, energy control systems, roofs and skylights. The idea is to measure initial energy use and environmental conditions to understand how the systems perform, and then to redesign and optimise their capabilities and performance. An exciting use of stimulus funds to help push the envelope (here in the US) on products to make projects like ours a bit easier in the future. I think I'm about to be your next door neighbor. Welcome to Red Hook! Look forward to meeting you. I shot some exterior scenes at Bart's workshop a few years ago(I'm a television location manager). Our Art Dept used him for many materials also. Pat, you are correct, I am your new neighbor. Very excited to be joining the community. You may have seen me around and did not know it. I have a little Smart Car. Send me your email address, so we can communicate directly. Jay@redhookgreen.com.